I have previously worked in the library, but this experience as a Learning Ambassador has been very different. I have been coming to The Field Library for many years. I grew up involved in many of the programs – story times, crafts, and other special programs – so I know what it’s like to be one of the kids. Then I became a volunteer. I helped with the summer reading games and volunteered regularly on Thursdays. That volunteering evolved into paid work. I worked to support the Saturday crafts programs and would sometimes work other days as a library page – that’s the person who puts the books away in proper order so you can find them again! Then I had the opportunity to become a Learning Ambassador. Even though I was familiar with library programs, I have never done anything like this. This is so hands on: I can choose the books and crafts and then design my own program! This experience has been really great. I have done so many things that I could not have previously done in the library. It has been rewarding seeing the children pleased with something that I have designed for them to do from start to finish. Working in the library has been great it has given me so many new experiences and skills that I know will help me in the future. To learn more about WLS’ Learning Ambassador Program, please click here. Westchester County, NY (July 31, 2013) – Westchester Library System is pleased to announce that TD Charitable Foundation has awarded a $5000 grant to support their youth outreach program, Learning Ambassadors. 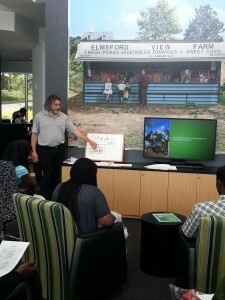 TD Store Manager, Anthony Andreana gives Learning Ambassador teens a lesson on managing money in the state of the art LEED Certified Gold Store in Elmsford, NY . Learning Ambassadors is a is a youth work-learn initiative designed to enrich libraries’ summer reading effort and provides meaningful work experiences for Westchester County teenagers. Within the library setting, teens are mentored, trained, and gain paid work experience to support library summer reading and literacy programs. This summer 22 teens are participating in the program, with eleven librarian mentors. Libraries participating in the Learning Ambassador program include: Mount Kisco, Mount Vernon, Ossining, Peekskill, Tarrytown, Tuckahoe, Yonkers Riverfront branch, and Yonkers Grinton I. Will branch. The program also extends to child care centers working with library programs in Greenburgh, Mount Vernon and Port Chester. Through their work, teens are ambassadors to their families, peers, and broader community for the fun and power of libraries and literacy. Over 3000 children and families will participate in the teen led summer reading activities in these participating libraries. For more information on Learning Ambassadors and Summer Reading Programs in your library go to www.westchesterlibraries.org. For information on TD Banks Summer Reading: https://mediaroom.tdbank.com/2013-05-03-TD-Bank-Kicks-Off-Summer-Reading-Program-Encourages-Kids-to-Keep-Their-Reading-and-Money-Saving-Skills-Sharp-During-the-Summer. The Westchester Library System (WLS) includes 38 member public libraries located throughout the County and is one of New York State’s 23 public library systems. WLS and its member libraries have a total collection of 5.3 million items, including 3.8 million books, as well as audio recordings, DVDs, print serials, and other materials. The mission of the Westchester Library System is to ensure that all residents have seamless access to excellent library service throughout Westchester County. The Westchester Library System serves as a center of innovation for the Westchester County library community. WLS provides model programs, affordable and easy-to-use information technology, and support services that enable libraries to continuously improve service to their communities. For more information, or to make a donation, please visit: www.westchesterlibraries.org. TD Bank, America’s Most Convenient Bank, is one of the 10 largest banks in the U.S., providing nearly 8 million customers with a full range of retail, small business and commercial banking products and services at more than 1,300 convenient locations throughout the Northeast, Mid-Atlantic, Metro D.C., the Carolinas and Florida. In addition, TD Bank and its subsidiaries offer customized private banking and wealth management services through TD Wealth®, and vehicle financing and dealer commercial services through TD Auto Finance. TD Bank is headquartered in Cherry Hill, N.J., and Portland, Maine. To learn more, visit www.tdbank.com. Find more mobile app information on our website.